Since the release of her debut LP Sometimes I Sit and Think, and Sometimes I Just Sit, Melbourne, Australia-based Courtney Barnett has been hailed as a refreshing anomaly; her extraordinary songs about ordinary life — panic attacks and house-hunting in gentrified neighbourhoods — has garnered the songwriter rave reviews from fans and critics alike. With an idiosyncratic style influenced heavily by '60s garage psychedelia and '90s indie rock, Barnett's seemingly laid-back, but deceptively heavy, emotionally honest approach to her songwriting have undoubtedly set her apart from the rest. Still, Barnett is the first to warn "put me on a pedestal and I'll only disappoint you / tell me I'm exceptional and I'll promise to exploit you" in "Pedestrian at Best," clearly demonstrating that she's aware of the pitfalls of too much praise. Most concertgoers have now come to expect mind-blowing live shows — shredding solos, lighter-led sing-alongs — and anything less would be disappointing. Barnett has set her bar high. 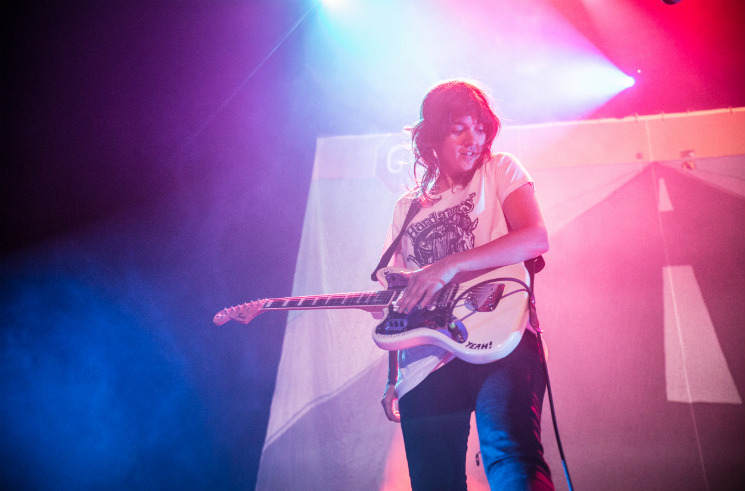 While her performance yesterday evening (May 29) contained all of the trademarks audiences have come to expect, it became increasingly clear that the joy in Courtney Barnett's performances come from within; she's unfazed by her own burgeoning fame, playing to a large, sold-out venue as if she were playing a small club to a group of friends. Opening with "Dead Fox" off Sometimes I Sit, Barnett and her band took to the stage with the song's animated, anthropomorphized music video playing in the background. She moved steadily through her LP, as well as her Double EP: A Sea of Split Peas with ease, multi-coloured lights and wild animations guiding the way. As the band progressed through "Scotty Says," "Debbie Downer" and then "An Illustration of Loneliness," all three had smiles spread wide across their faces, making the entire performance feel effortless. The mood shifted, however, when Barnett began playing the dissonance-heavy solo to "Small Poppies." Showing off her undeniable skill with an animated black monster with yellow eyes as a backdrop, Barnett — along with bassist Bones Sloane and drummer Dave Mudie — showed the diverse crowd just how talented each of them were individually, and just how powerful they could truly be as a trio. Moving through new song "Three Packs a Day" and "Elevator Operator" at breakneck speed, limiting banter to "hey" and "thanks," the crowd's adrenaline stayed high, even through the excellent slow-burner "Depreston," placed near the end. After ending the with single "Avant Gardener," Barnett and company returned for a short encore, consisting of "Pickles in a Jar" and "No One Really Cares If You Don't Go to the Party." If one thing's to be said about Barnett, it's that she provides reason for the old adage "less is more." ​Courtney Barnett Releases New Song "Everybody Here Hates You"
​Courtney Barnett Shares New Song "Small Talk"